Lehmann coached, taught, directed and “master-classed” a huge number of singers. She was always proud of her students and their accomplishments. In every interview she managed to include some of their names. Some articles and books have mentioned fine singers as Lehmann students, who did NOT study with Lehmann. The following: Shirley Verrett, Mattiwilda Dobbs, and Elisabeth Schwarzkopf never studied with Lehmann. 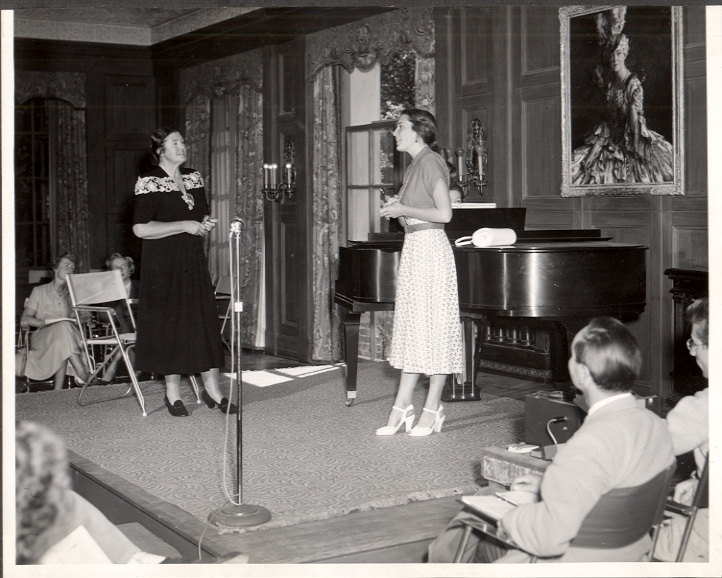 Long before Lehmann taught at the Music Academy of the West she coached singers including: Jane Birkhead (hear her NPR Interview on Lehmann), Eleanor Steber, Risë Stevens, Rose Bampton, Nan Merriman, Dorothy Maynor, Anne Brown, (the original Bess in Porgy and Bess), Jeannette MacDonald, among many others. During Lehmann’s MAW years, and privately thereafter, star students included Jeannine Altmeyer, Karan Armstrong, Judith Beckmann, Grace Bumbry, William Cochran, Kay Griffel, Marilyn Horne, Lotfi Mansouri, Mildred Miller, Norman Mittelmann, Carol Neblett, Maralin Niska, William Olvis, and Benita Valente. Perhaps less well-known, but respected in their fields are singers such as Lois Alba, Judith Allen, Tami Asakura, Helen Barlow (Harrison), Kathryna Blum Barone, Patricia Beems, Anne Bollinger, Helen Bolton, Larry Case, Olga Chronis, Lincoln Clark, Enid Clement, Jean Cook, Coleman Cooper, Dr. Sister Marietta Coyle, Robin Craver, Grace de la Cruz, Gretchen d’Armand, Martha Martin Deatherage, Archie Drake, Ruth Drucker, Elizabeth Erro (Hvølboll), Jeanne Evans, Earl Fisher, Oma Galloway, Edna Garabedian, Janice Gibson, Charles Glass, Kay Griffel (Sellheim), Leslie Guinn, Jane Guthrie, Kathryn Harvey, Marvin Hayes, Joan Heels, Ronald Holgate, Enid Jacobson, Patricia Jennings (Armstrong), Emma Jost, Beverly Ka’ana, Julia Kemp (Rothfuss), Joy Kim (Slote), Ruth Landis, Alice Lee, Martha Leiter, Diane Leoncavallo, Martha Holmes Longmire, William Longmire, Arnold Leverance, Susan Nalbach Lutz, the Rev. Patrick Maloney, Leila McCormack, Kay McCracken (Duke)(Ingalls), Adair McGowan, Margery McKay, Raymond Manton, Brunetta Mazzolini (Graham), Joseph K. Meyers, Douglas Miller, Richard Milius, Ronald Mitchell, Allan Monk, Ron Murdock, Sally Murphy, Eleanor Murtaugh, Bonney Murray, Timothy Mussard, Rosalind Nadell, Roy Neal, Nitza Niemann, Alice Marie Nelson, Katsuumi Niwa, Evangeline Noël, Rose Palmai-Tenser, Sue Patchell, John Pflieger, Mary Beth Piel, Naka Pillman, Beata Popper, Harve Presnell, Marcella Reale, Brenda Roberts, Guy Rothfuss, Martile Rowland, Sylvia Rolands, Chieko Sakata, Roy Samuelsen, Dorothy Sandlin, Conrad Schultz, Kenneth Shelton, Myron Slater, Gretchen Smith, James Standard, William Swan, Page Swift, Daniel Taft, Riki Turofsky, Shirley Sproule, Delcina Stevenson, Mary Lou Sullivan-Delcroix, Luba Tcheresky, Henrietta Valor, Jeannine Wagner, Lenno Wells, Shirley Westwood, Elizabeth Winkie (sp.? ), Linda Williams (Eddy), Seoung Lee Wilson, Joan Winden, Kenneth Wohn, Rae Woodland, Roland Wyatt, Shige Yano-Matsuura, Maria Zahlten-Hall, and many more. Manhattan School of Music students in the 1965 Town Hall master class included: Marc Vanderwerf, Barbara Blanchard, Celina Kellogg and Glenda Maurice. 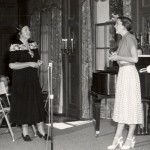 Famous singers who coached with Lehmann or were in her master classes include: Marni Nixon, Hermann Prey, Gérard Souzay, Hilde Güden, Janet Baker, Thomas Moser, Rita Streich, Raimund Herincx, Glenda Maurice, Alberto Remedios, and others. 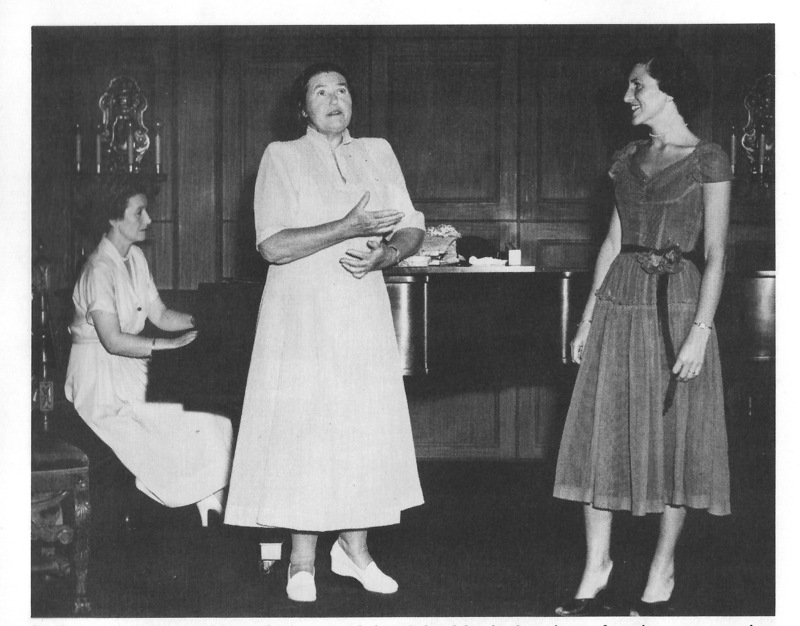 And remember that Lehmann was a director/adviser of the 1962 Rosenkavalier for the Met, when she coached the famous cast of females that included Régine Crespin, Anneliese Rothenberger, and the reluctant Hertha Toepper.